I rotate the compass and stare to the horizon, catching a distant mountain rising over the tundra. There is no trail, no marked path to set my feet upon and let my mind drift, to forget where I am and what I am doing. There is nothing but me, the spinning red compass, the mountain, and the puzzle to unravel between us. The Arctic tundra rolls away from me, rising and falling like a frozen sea. Streams of melting snow cut into it. Bogs and lakes hide in the folds. I pick my way across, hill by hill, moving on their shoulders, finding the shallow pieces of streams to hop across, slipping past jumbled rock on the green tundra. My mind lights on fire without a path to follow. My senses raise from civilization’s slumber. I see, smell, and hear the world around me. The birds whistling my passing. The tufts of reindeer fur shed from winter coats that drift in the wind. The wet air hanging over bogs. Piece by piece, the the land comes together in my mind. The flow of it, the contours that run from the deep earth to the surface. An old electric line shoots off in my direction. Mounds of hand-placed stones still hold the posts in place. The wire rusts in curls on the ground. I follow the it , but only with my eyes, only as an arrow pointing to a place. A straight line is no way to move across this land. That is civilization’s way. That is brute force. I don’t have the strength nor the desire to be brutal. Instead, I follow streams cutting through the softer earth and walk the high curve between hills. I trace reindeer paths worn into the land by generations, movement passed from mother to calf to me. From the mountain, I sight another. From that, the next and another beyond. I move, slipping into the world as I move across it, feeling a part of it, a visitor no more, but a piece in the whole, moving, becoming, finding a place. 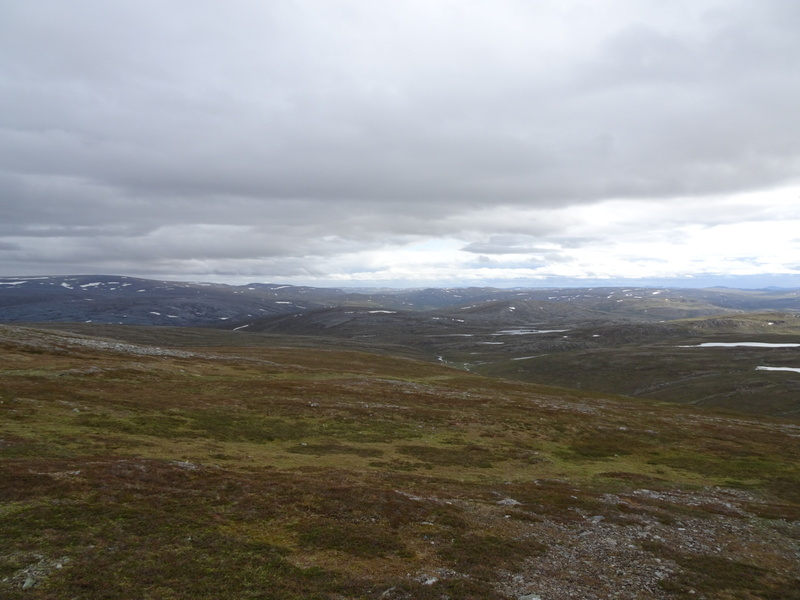 Posted in Europe North to SouthTagged adventure, backpacking, ENS, Europe North to South, featured, hiking, nature, Predictably Lost, PredictablyLost, reindeer, route finding, thru-hikingBookmark the permalink. You seem to be moving into the space that I saw you in when I connected with you in the CDT. Not many have been to that space. It is definitely a “here and now” space coupled with acute sensitivity to the natural world. Happy for you. Enjoy. Admin question: is this all public land? If so, who manages it? I am not sure, but in Norway I believe there is a right to pass and camp on undeveloped land as long as you don’t encroach on structures or the owner’s uses. Basically, be respectful. Beautiful…didn’t take you long to get into the groove.